So anyway,: Is the future all-girl? It always seems to take me ages to get round to blogging about the Doctor Who season finale, but at least this time I can make it coincide with the BBC's announcement that Jodie Whittaker will be the 13th Doctor. "World Enough and Time" / "The Docto Falls" by Steven Moffat, directed by Rachel Talalay. Spoilers after the cut. The fact that the new Doctor's a woman is of course all everyone's talking about, and some people have been getting hilariously upset about, but anyone paying attention should have been able to spot it was a distinct possibility: Steven Moffat's been making sure the door's open for his successor to cast a woman at least since the first appearance of Michelle Gomez as Missy, and this two-parter in particular dropped a ton of hints. Not least of all in the Master's comment that I used as a post title, or indeed the fact that John Simm's version of the character returned to share the screen with his later, female self. The ending suggests that Peter Capaldi's farewell at Christmas will be all about him resisting change and, presumably, finally embracing it, and what better way to show that than with a bigger change than ever before? Although the episodes were suitably epic I don't know that I was quite as into them as I have been with most of the rest of this series; maybe we started too well, with the notorious troll Moffat giving the biggest in-universe troll a whole "his real name's actually Doctor Who" running gag, and presumably causing twice as many remote controls to get thrown at the TV as today's announcement did. But the Cybermen are never my favourite baddies, although full marks for bringing back a version of the original 1960s design and proving it can be creepier than any of the more polished ones. 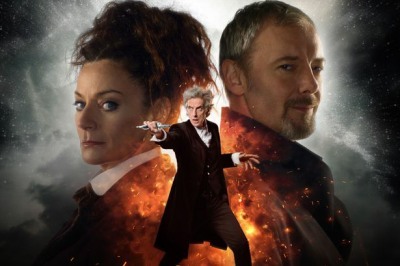 The Master/Missy double-act was great fun though, and the flirting between them wasn't so much creepy as it was entirely expected - I was more squicked out by Samantha Spiro coming onto Matt Lucas in no uncertain terms. Although Pearl Mackie's been a hit, Bill leaving as a regular companion is probably right; I don't hold with the whole "the Doctor should be sexless" stuff, but getting a lesbian companion then turning into a young woman might be a bit too on the nose. Anyway, we need a hot young male companion now, and "going off to be dripping wet space lesbians with Heather" is a good happy ending for Bill - her new time-and-space travel abilities leave the door open for her to come back, and she really should, I don't like the idea of the Doctor thinking she's been trapped as a depressed half-Cyberman but just moving on with her next adventure anyway. I didn't watch "The Doctor Falls" as it aired and people on Twitter spoiled the fact that the First Doctor would appear; I didn't know if this meant some CGI of William Hartnell, but wondered if we might get David Bradley-as-Hartnell-as-The Doctor after his version of him in a TV film a couple of years ago, and was pleased to be proven right; and for the Christmas Special too, bring it on. Good luck to Jodie Whittaker, with Chris Chibnall taking over as showrunner she's going to need it. I'm not hugely familiar with her work, I've only seen her on stage once, but that was sharing the stage with one of her predecessors, Christopher Eccleston, so that's a pleasing connection.